These two things are not the same. Left: a farm in Montgomery County by thisisbossi. Right: a house in Laurel by Eli Pousson. Image by the author. Here's a second look at zoning in the Washington region, with particular thanks to contributors Chris Slatt and Payton Chung for helping me sort a few things out. I welcome additional tips from helpful readers, as there are still a few things that might not be right with this map. 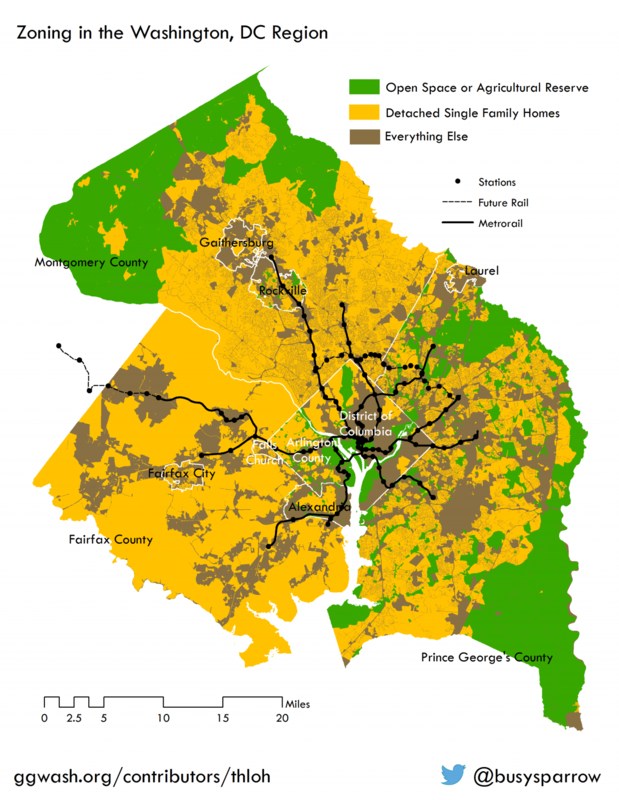 For example, Fairfax County's zoning ordinance appears to not contain a zone for open space or agricultural reserve (though perhaps I am misinterpreting the R-A zone, which I did not include here as it allows single-family homes). See anything else missing? You may notice that the Montgomery County total percentage changed from yesterday. I made an error in the denominator of the original calculation, using the area of the county *including* Rockville and Gaithersburg, even though the caption on the table said otherwise. These calculations have been double-checked and corrected. Recalling the original figure from Minneapolis, that 75% of the city was specifically zoned for detached single-family homes, we can now more accurately see that our urban core is in a similar situation, but for a different reason. The large percentage of undevelopable land in the urban core and surrounding counties puts additional development pressure on the land that remains, and on jurisdictions that lie even further out, like fast-growing Prince William, Loudoun, and Howard Counties. 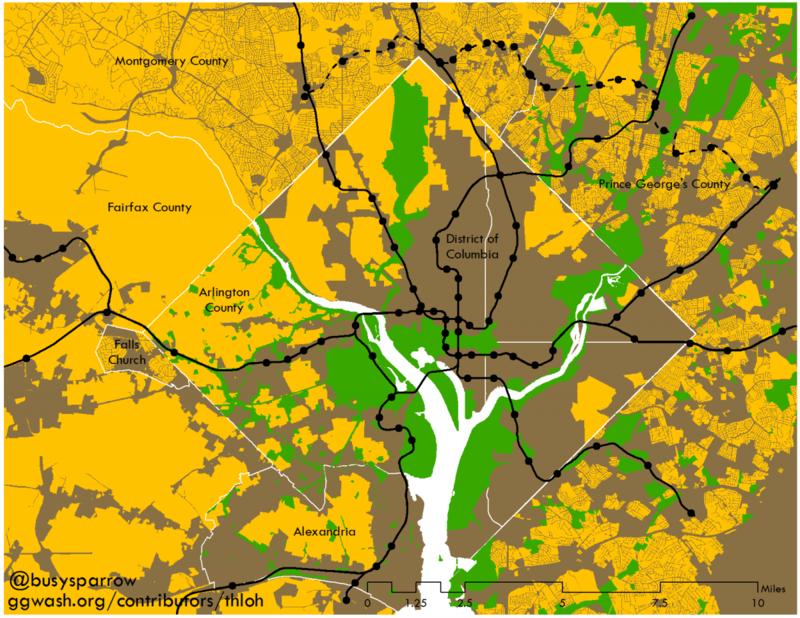 In order to prevent that sprawl, we need a really ambitious vision for DC and the surrounding jurisdictions. To that end, I included the Metrorail network as an overlay on these maps, as requested by some readers. I also added the Silver Line extension and the future Purple Line (though that will be operated by the Maryland Transit Administration and not by WMATA).